The game presents a series of physics-based puzzles, the objective being either to keep structures made of blocks from being knocked down or to knock them over by various means, using to throw, shoot, and grab at the blocks. 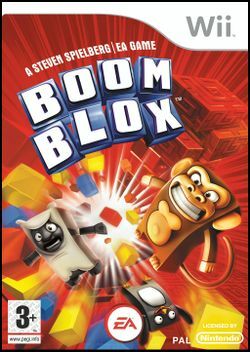 Boom Blox features a realistic physics system; the angle at which a projectile is launched and how fast it is thrown as well as the mass of the projectile and the type of blocks it comes into contact with influence the results of an action. Boom Blox has been described as Jenga meets Tetris Blast, Breakout, Duck Hunt, and Lego. Gameplay emphasizes reflexes, dexterity, and problem-solving skills. It features a physics model that ensures the blocks collapse realistically, and also measures the velocity at which an object is thrown, recognizing three distinct speeds. In the game, players use to manipulate bowling balls, baseballs, laser guns, and water hoses in order to knock over structures made of blocks. Alternately, they use to grab blocks in Jenga-style gameplay, taking care to remove a maximum number of blocks without toppling the precariously stacked tower. This page was last edited on 10 July 2017, at 11:07.